Nitro Update: Lightweight, state-of-the-art protection that won’t slow down your PC. Nitro Update: CyberCapture – capture unknown files to stay one step ahead of cyber threats. Nitro Update: Improved SafeZone browser – the world’s most secure browser®. Passwords: Manage your passwords safely and conveniently across all of your devices. Home Network Security: Better protection for everything on your home network. Lightweight, state-of-the-art protection that won’t slow down your PC. 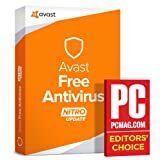 Avast Free Antivirus — Nitro Update now runs a significant portion of its analysis in the Cloud instead of on your PC. It offers proprietary, cutting-edge CyberCapture technology that identifies and stops unknown files, as well as improved Home Network Security, which identifies even more weak points in your router. It also features the world’s most secure browser®, so you can shop, browse, or bank safe from hackers and online ads. This proprietary, cutting-edge technology detects and captures unknown files to keep you one step ahead of cyber threats as they evolve. Potentially dangerous files are sent to the Avast Threat Lab for real-time analysis by our experts — and quarantined if dangerous to keep you safe. Designed to make browsing safer and more convenient, SafeZone is the world’s most secure browser. Bank Mode makes sure you shop and bank in total privacy, Ad Blocker keeps annoying ads at bay, and Video Downloader lets you watch your favorite videos offline — whenever you want. Even better protection for all the devices on your home network. The Avast Nitro Update detects even more router vulnerabilities than before, so you can keep your Wi-Fi cameras, connected TVs, printers, network drives, and routers fully secured. It’s time to get over bad habits like storing passwords on your browser or reusing the same one over and over again. Avast’s new password manager creates a safe, convenient space to store your passwords, which you can access with one master password. Improved WebShield technology allows your Avast to scan all HTTPS sites for malware and threats. It whitelists your banking sites and bank certiﬁcates too, so that scanning doesn’t slow your access one bit. Why let anyone change your search provider without your permission? Browser Cleanup gets rid of any bad add-ons and unwanted toolbars, so you can restore the settings you like. As the antivirus of choice for 400 million users around the world, we find malware fast and respond even faster — no matter where it starts. By combining massive data engines running AI software with some of the smartest virus spotters in the world, we constantly double — and triple — check the latest threats to keep you safe. We continue to improve the world’s most trusted antivirus and anti-malware engine to keep you better protected. Using security updates the size of a text message, we distribute updates several times an hour to keep you completely up to date. An all-in-one scan, all in one go. Check your computer’s operating status, make sure there are no network threats, malware or viruses, and search for outdated software in just one click. It’s the easiest way to stay safe. Keep your PC running like new. Optimize your settings, and get rid of unnecessary junk, so you can make room for the things you really want like movies and photos. Cleanup makes your PC more efficient, so you can be more efficient too. A private channel just for you, even when you’re on a public network. Keep your chats, photos, and emails safe, with a world-trusted VPN. SecureLine encrypts everything you send and receive, hides your IP address — and lets you change it, too — so you can avoid geo-restrictions and access content from around the world. Hackers love to exploit old software. Software Updater lets you know whenever there is an update to the software you’re running — so you can quickly patch any weak points before hackers have a chance to attack. A powerful spam and phishing filter to keep your inbox clean, lean and safe. Works as a plug-in to Outlook® and as a generic POP3/IMAP4 proxy for other email clients — now with better reporting functionality. Phone, PC, and tablet all protected by Avast? Great. You can control and manage all your devices directly from one Avast account. This entry was posted in Software and tagged Antivirus, Avast, Download, Free, Nitro, Update by Computer Education World. Bookmark the permalink.